We are extremely excited to announced that Reef Savvy has not only met their $20,000 target donation for the St. Jude “Give Thanks. Walk” charity event, but they also destroyed it. Thanks to the aquarium builder, a ton of aquarium equipment and service companies that donated accessories, and all of the generous people who have purchased raffle tickets, Reef Savvy was able to top $26,000 with still plenty of time left to donate items to the raffle or purchase a ticket to enter to win all of those awesome goodies. It truly is heartwarming to see so many people coming together for this extremely generous donation, some of which isn’t just products but time and other valuable resources. We have already covered many of the details of this raffle, but we wanted to take the opportunity to update the full (and steadily growing) list of items that have been added to the raffle prize. Reef Savvy: 100G 4 sides low iron, Red Bottom Rimless Reef Ready Aquarium. Unishippers Las Vegas: Residential Delivery of 100G Reef Savvy aquarium, anywhere in the Lower 48 States! Tunze USA: Tunze Osmolator 3155, shipped to your door! Benner’s Woodworking: Modern Series, Matte Black Cabinet! Turbo’s Aquatics: Turbo L2 HF algae scrubber, with pump, shipped to your door, anywhere in the Lower 48 states! PROLINE Aquatics: Vertex Libra Stepper Dosing Pump, shipped to your door! ORA: 6 Premium Frags shipped to your door! Alpha Aquaculture: $300.00 worth of clownfish, shipped to your door! EcoTech Marine: VorTech MP40 pump, XR15FW light with suspending hanging kit and 295ml bottle of Coral Glue. Rod’s Food: 1 year supply of food and a Rod’s Food T-Shirt, shipped to your door! Reef Top Aquariums: EcoTech MP40 pump, shipped to your door! Coral Logic Aquariums: Eheim 1262 Return Pump, shipped to your door! MarcoRocks.com: Complete CherryScape of rock shipped to your door! VIP Reef: 3 Ultra Flower Anemone’s ($360.00) shipped to your door! SaltwaterAquarium.com: 6 month membership (2 quarters) to the Saltwater Aquarium Food of the Month Club, shipped to your door! Living Reef Orlando: $300.00 of coral shipped to your door! Cherry Corals: $250.00 Gift Card! Roggers Reef Food: 1 year supply of food (12) packages, 6 packs of Signature Coral Blend, Food Clip and a Roggers Reef Food T-Shirt shipped to your door! LRS Reef Frenzy: 1 year supply of food (12) packages, 6 packs of Seaweed and an LRS T-Shirt shipped to your door! Orphek: Azurelite Flashlight shipped to your door! Melev’s Reef: 100 GPH RO/DI Unit shipped to your door! Orphek: Two (2) Atlantik Pendant WiFi, Router & 7″ Android Tablet shipped to your door! Neptune Systems: Full APEX System Shipped to your door! Synergy Reef Systems: White Series SS-28 Sump shipped to your door! Next Reef Systems: MR1 Media Reactor & SMR1 Bio-Pellet Reactor shipped to your door! Global Oceanic Life: Next Reef Systems NSX1 External Recirculating Protein Skimmer shipped to your door! High Def Corals: $250.00 box of corals shipped overnight to your door! Reef Bliss: 10 containers of Reef Boom, shipped to your door! 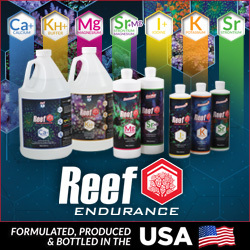 Ocean View Aquariums: Seachem Basket featuring the full line of Aquavitro Reef Supplements, Matrix Carbon & Phosguard shipped to your door! That is almost 30 companies donating thousands upon thousands of dollars worth of aquarium equipment, livestock, and supplies. In closing, we wanted to thank Felix Bordon and the Reef Savvy crew for helping to make this world a more beautiful place, not only with their awesome aquariums but also with their amazing generosity.